The instrumental factor that placed India as an emerging fashion hub on the global map of fashion in the past two decades is National Institute of Fashion and Technology. The institute since its establishment set rising high benchmarks by always being unique from others and has created some of the biggest achievers who are presently ruling the Fashion Industry. In the present scenario, NIFT is considered as a leader in fashion education with the ability to integrate knowledge, academic freedom, critical independence and creative thinking. Every year to offer admission in the undergraduate and postgraduate degree programs, National Institute of Technology conducts NIFT Entrance Exam on all India basis. · Age Criteria: The maximum age of the candidate as on October 1 of the on-going year should be 23 years. In case the candidates belong to any of the reserved category then 5 years relaxation is applicable. Candidates who have passed Class 12 or equivalent examination from any Public School/Board/University Examination in India or in Foreign countries recognized by the Association of Indian Universities are eligible. For Bachelor Programme (B.F.Tech): Candidate should have either passed or appearing in Class 12 Board Examinations of any recognized Central/State Board of Secondary Examination with Physics, Chemistry and Mathematics. Candidates who have passed Class 12 or equivalent examination from any Public School/Board/University Examination in India or in Foreign countries recognized by the Association of Indian Universities are eligible with Physics, Chemistry and Mathematics. NIFT 2016 has done away with Offline Application process. Interested candidates have to apply online at the official website. Mode 1: NIFT Payment Gateway: candidates can make the fee payment through credit cards / debit cards. Mode 2: Demand Draft: The Demand Draft should be issued in favour of “NIFT HO”, payable at New Delhi. 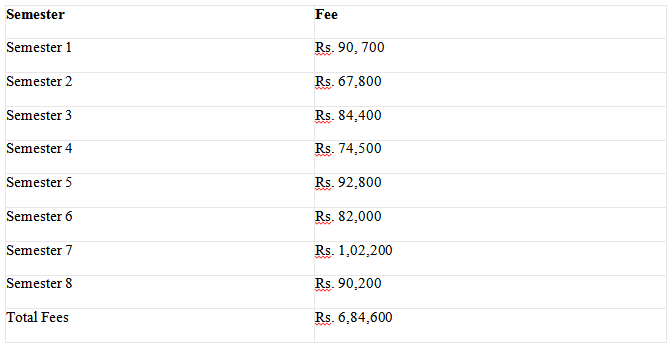 Approximate Semester wise fees for students selected for admission in NIFT. I am so glad to have a chance to read your wonderful article. I am looking forward to read more of your works and posts. How to Improve Academic Essay Writing?